Ever wonder what it’s really like to visit the Google headquarters? Madden Media superstars Alexis Favis and Vanessa Abril-Gutierrez were able to join our partners Jason Holic and Jessica Castro from Experience Kissimmee at Google’s main campus in California last month. Our very own Amber Ayers asked them to recount their adventure to Silicon Valley and share their experience with everyone. You recently made a trip to Google’s Partnerplex in Mountain View for a Google Executive Summit. Tell me about some of your expectations for the trip. VG: My expectation of the trip was to build our partner relationship with Experience Kissimmee (EK) and take an in-depth look at their current efforts to identify opportunities for growth so that we can take their campaign to the next level. Our goal is to ensure that we are doing all that we can to have a top performing campaign. AF: From the client relations side, solidifying our relationship as a Google Premier Partner as well as bringing Kissimmee directly into those conversations for more collaboration on their Google campaigns. What was your first impression of the campus? AF: We visited the quad campus first and that blew me away with the amount of people, and the energy, and structure. Then actually visiting the Google Partnerplex was really special. The entrance to the Partnerplex is even guarded by security, which I wasn’t expecting. Not just anyone can enter. You truly do have to be invited. It really solidified how unique of an opportunity this was for Madden & EK. VG: What I thought was exciting was that it has a very casual atmosphere in the way that it is set up. It’s still very structured in a way where it just oozes smart people. You really felt like everybody was on their game. VG: Yes! I felt a presence of being with really knowledgeable people. It was pretty cool. Is the cafeteria really as cool as they say it is? AF: It’s a whole ordeal and the food is really, really good. That was some of the best Indian food I’ve ever had and obviously there was pizza, so I was thrilled. VG: Even the remote site was pretty cool. They had a coffee bar where we could fuel up, which got our ideas flowing, especially after a latte and Americano. What does it mean to you to be a Google Premier Partner? VG: For us to be a GPP is special because of the fact that we are that next level of what Google expects an agency to be. Not only from the amount of spend that we have with them, because it’s really easy for agencies to spend money with Google, but the performance aspects of it. We have to maintain a certain level of performance in order to have the Premier status. In addition to that we’re also badged in specialties—video, search, display, and mobile. That’s just another added bonus. The thing that I love about it, when we first became the Premier Partner and started working with Google directly, is the amount of access and the additional tools that we have outside of just the platform itself. With additional reporting, and being able to bounce our ideas about optimization off a third-party, which is Google, is priceless. We try to stay on top of our game as far as optimization, but to have that extra, “hey guys what do you think about this?” and have them come back and say “that’s a really good approach”—having that extra access, an allied human to go to is really priceless. Our reps are so communicative and knowledgeable and they are not afraid to bring up new ideas. AF: That direct human contact—and you can tell how genuinely interested they are in learning about our vertical and all the nuances. They get excited about it too because we are educating them on this whole vertical of travel and tourism. The Premier Partnership shows how hard our team works to keep up that performance which is really impactful for what we do on the client side in terms of ensuring we can back-up the performance of all our campaigns. What are some unexpected experiences you encountered? AF: Getting to visit the quad campus was unexpected. We hadn’t initially planned on that, but it added to this unique experience. VG: I wouldn’t say there was anything unexpected—I knew I was going to be wowed. I appreciate the fact that our reps really went above and beyond to make sure that we were comfortable, even at the remote office. When we were at the Googleplex, it was the same—making sure we were comfortable, EK was comfortable, and we always had what we needed. That level of attention to detail in addition to the fact that they wanted to make sure we were happy was like—WOW. We weren’t just there for an every-day meeting, this was really showing our bond. You mentioned our partner, Experience Kissimmee. Were you able to gain some insights on their current and future digital marketing efforts? VG: Yes, we actually were able to gain quite a few insights. Not only for their existing campaigns, but we also identified opportunities for things that they aren’t currently running and provided data and facts to support reasons why they should be doing it. AF: That is another GPP benefit. We can get introduced to betas that are really good fits for our clients and they are always trying to bring those opportunities to us, where we wouldn’t be able to get those otherwise. All of the data and resources that we get as a GPP really sheds some light on their campaign and gave us and EK quite a few ah-ha moments—things they were excited to take back to Florida with them. What’s next for the future of digital marketing with Google and its brands? VG: The machine learning and smart bidding is really their focus—what we are working with them on. Something else is the attribution models that we bring to the table. AF: That’s a really good point regarding the attribution innovations, because for the vertical that we work in, it’s often a soft conversion, so to speak. There are a lot of other factors that play into conversion, so specifically for DMOs and CVBs, finding new ways to do attribution is really exciting. Video is going to be the cornerstone of more digital marketing campaigns, so I’m excited about all the capabilities we have to distribute that with Google. All the different strategies, video lengths, where consumers are seeing video, and the content of those videos at different points in the travel cycle can be leveraged in campaigns. VG: Back at the beginning of 2017, when they had their Google Next Keynote speech, you could really see the areas of that speech tied into the products that we’re implementing, including attribution. I feel like that tied together with their goals as a company. You could see that in the way that they were speaking to us about their products that we are implementing for our partners. 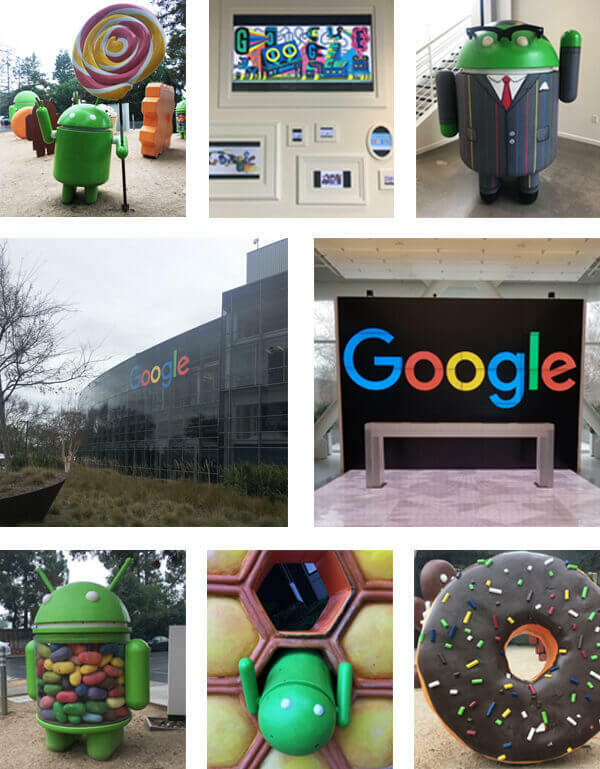 Vanessa & Alexis’ insider travel tip: Android Statue Garden—Google has an Android statue “graveyard” with all of the past versions of Google’s Android mobile operating system, based on their code names, named after desserts and sweet treats. The garden is located next to the Google Merchandise Store, which is open to Google employees and their guests. Partner with the experts at Madden.